Without Warning by Lynette Eason, a Mysterious Review. Review: Kate Singleton, a bodyguard with the Elite Guardian Protection Agency, came upon her most recent assignment in a most unexpected manner. Spotting police cars with their lights flashing in front of a familiar restaurant, she stopped to talk to Inspector Quinn, the crime scene investigator, and learned that a man had been found hanging from a pipe in the basement, in Without Warning, the second mystery in this series by Lynette Eason. The dead man was a chef at the restaurant, recently fired by the owner, Daniel Matthews, for stealing money. Whether it was suicide or murder was yet to be determined. Kate knew Daniel through his 17-year-old niece Riley, who was in one of Kate's self-defense classes. Later that night, another of Matthews' restaurants was found ablaze, probably the result of arson. It seems that someone is trying to put Matthews out of business … and using deadly methods to do so. Kate offers the services of her company, but Matthews isn't convinced he needs them, though it seems hardly to be a coincidence that two of his restaurants are crime scenes at the same time. A third attack, and the urging of his niece Riley, makes him reconsider his decision. Who could be targeting Daniel Matthews, and almost as important, why? 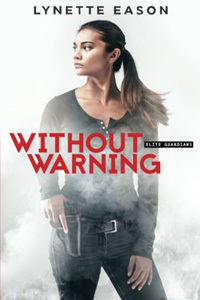 Without Warning boasts an engaging cast of characters, from Kate Singleton and her partners to the victims, Daniel Matthews and his niece, Riley. There is a lot of crisply written, often witty, dialog between the principal characters. The storyline is solidly developed and executed, resulting in a strong finish to the book. A fine entry in this outstanding series. Special thanks to guest reviewer Betty of The Betz Review for contributing her review of Without Warning. Acknowledgment: Baker Publishing Group provided a copy of Without Warning for this review.